The little guy is Berto, and he has a thing about photo bombing… watching me, and wanting to be in the loop on everything, especially food and the location of my dirty socks, which he hoards.. 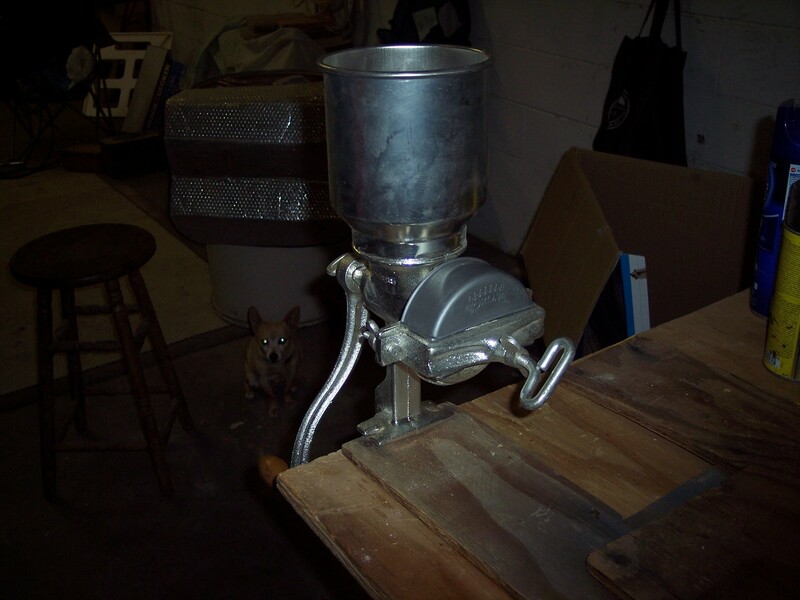 The masa grinder is the subject.. if you want fresh corn tortillas or masa dough for tamales it’s the way to go…. you can buy masa in a lot of markets and its usually good, but home made is better. Of course it gets used for more than that, it grinds nuts for walnut butter or whatever and chickpeas for hummis.. which is a chore a lot of blenders can’t handle and I make a lot of it..
I’ve never tried using it for flour for some reason.. But I’m pretty sure it’s because of the burr plates.. I have my doubts it will do the job and its a lot of trouble to find out..
Or at least that’s the current theory to justify a mill or quern..